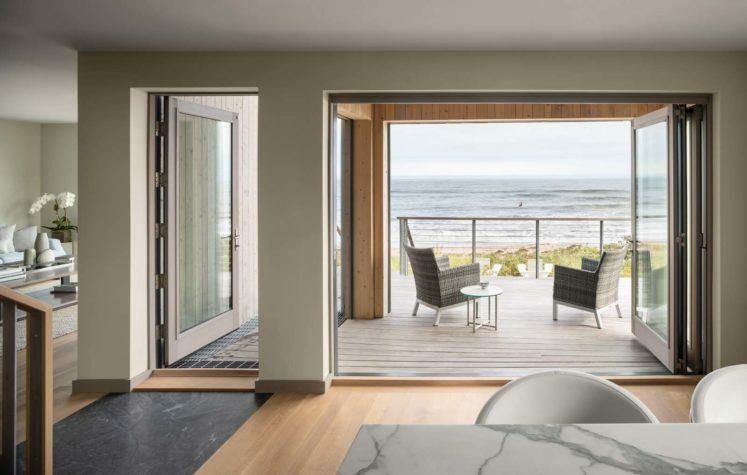 Architect Caleb Johnson placed his client’s new cottage at Moody Beach on rounded wooden piers sunk into concrete five feet below grade. He broke up the building’s mass into two volumes. 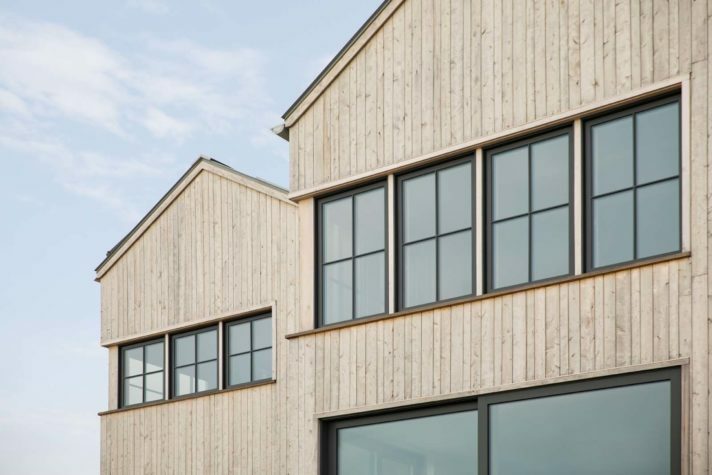 The cottage is clad in vertical white cedar shiplap, sourced locally. Surging water can flow under the home and then back to the ocean. 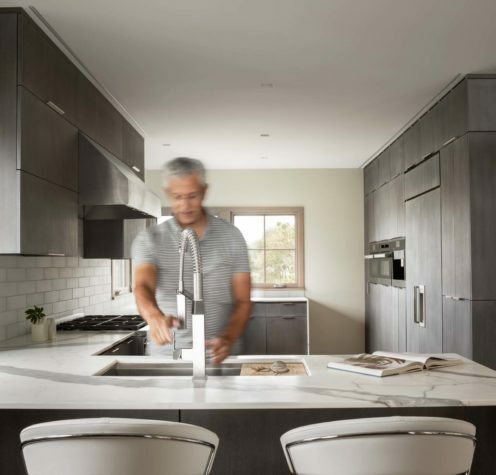 The kitchen is contained in the larger volume, as are living and sleeping spaces. 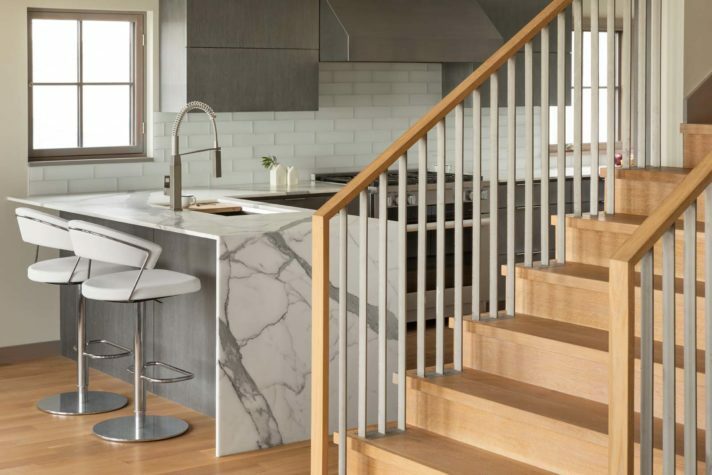 The kitchen countertops are statuary marble, with a faucet by Ferguson. In the double-height hallway, a slab of Jet Mist black granite graces the entry, while a trio of lighting pendants from the Raimond Collection by Moooi illuminates the upper space. 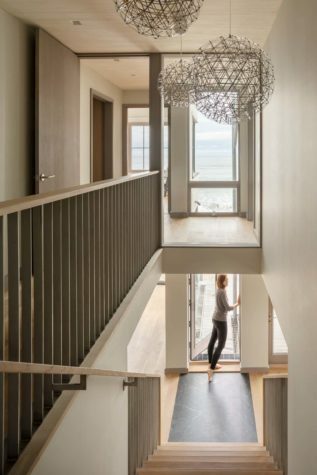 The architect’s assignment from the client was for something simple, streamlined, and of the environment—and especially a design that takes advantage of the views, such as the ones seen in the living room and the bedroom. 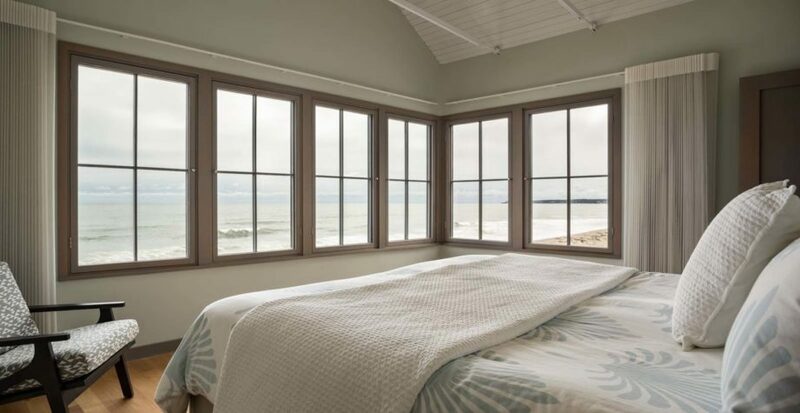 The screen porch opens to a deck and out to views of the beach and ocean. The dining room table and chairs are from Huston and Company. Caleb Johnson can cite a trio of criteria crucial to any project’s success. 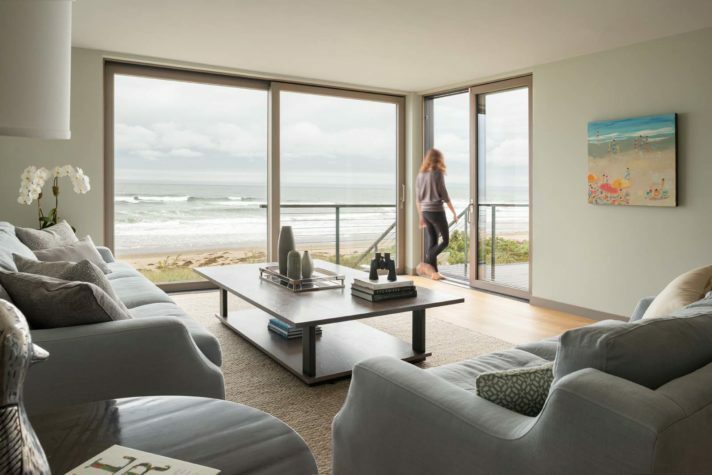 But in the case of a beach house on Moody Beach in Wells, just over the Ogunquit line, the client and her husband played a major role in their alignment. She’s a Massachusetts native who’s been running a highly successful New York asset management company for the past 30 years. She knows how to make a project a reality and how to collaborate. He took that statement back to his studio and started sketching and talking with one of his associates, seeking to refine design solutions. Then he went back to the client, engaging her in the ideas they’d come up with. “She said, ‘It’s not right yet,’” he remembers. 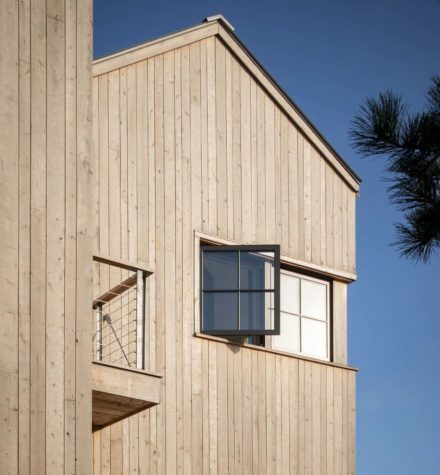 The immediate landscape at Moody Beach is dominated by a series of one- and two-bedroom cottages built in the 1940s, each with a distinct New England feel: shingled, unpainted, and untreated. Some have been replaced, but even the newer cottages retain that rustic feel. 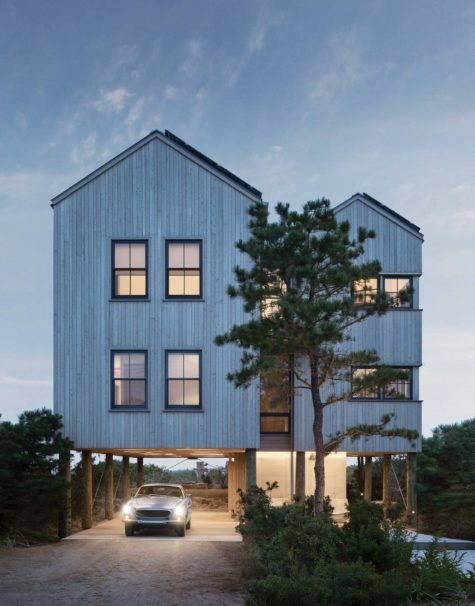 The client knew she wanted that kind of character too—not necessarily with cedar shingles, but possibly with vertical planking. And she did not want to overpower her neighbors. Johnson’s solution was simplicity itself, totally rooted in the local vernacular. “He said, ‘I see two little lobster shacks,’” the client recalls. And, of course, there was the site, which provided its own set of challenges. The lot is 50 by 100 feet and regulated in terms of building size and height. 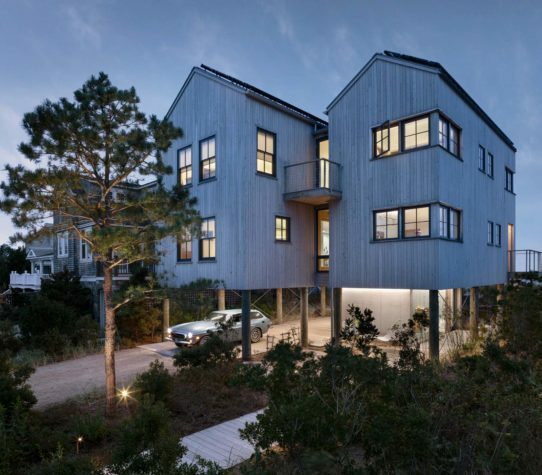 The home’s footprint could be a maximum of 1,300 square feet, with a total allowed living space of 2,600 square feet. “Given the size of the site, we didn’t want to do something oversized, but we didn’t want it to be too small a building either,” the client says. The owner and her husband own homes around the world, including one in New York and another on the Red Sea, but wanted this one to be their home base as they move into retirement. Offices for each are contained in the smaller volume, while living and sleeping spaces are in the larger. Both offer sweeping views. 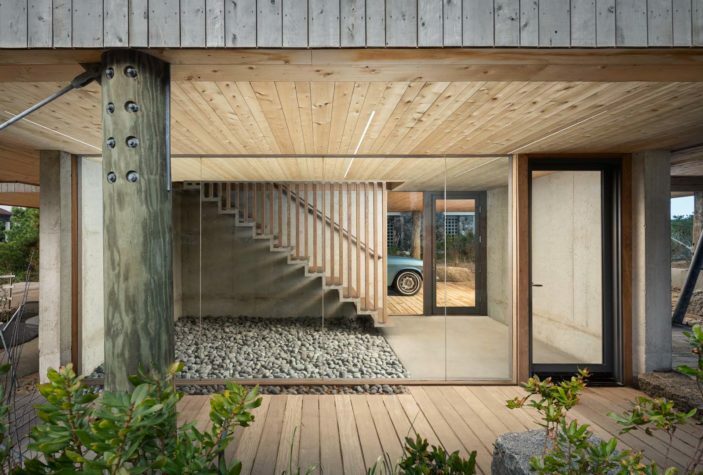 Both volumes offer sweeping views of Moody Beach and the Atlantic Ocean. The bathtub is a solid surface tub from Badeloft.